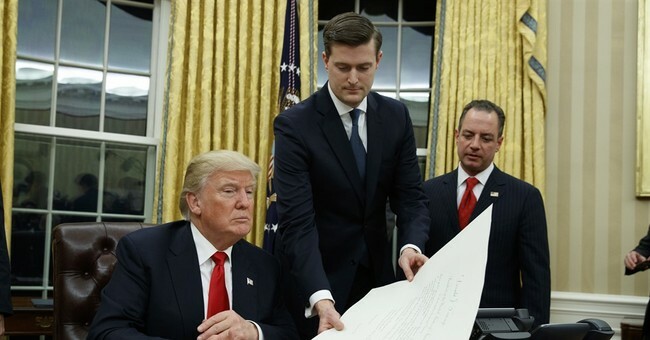 White House staff secretary Rob Porter resigned Wednesday following allegations of domestic abuse from two of his former ex-wives. Colbie Holderness, his first wife, told the Daily Mail about the tumultuous times during their five-year marriage, which included being choked, punched, and verbally and emotionally abused. ‘At times, the way he would be physically violent with me was very odd. He would throw me down on the bed, then put his full body weight on top of me, then grind a knee or elbow into my body, expressing rage. The violence escalated to where Porter was choking his wife. ‘It was not hard enough for me to pass out but it was scary, humiliating and dehumanizing,’ she said. Holderness’s allegations come after the Daily Mail spoke with his second wife, Jennifer Willoughby, about the abuse she endured in their marriage as well. Willoughby, 39, said she was ‘walking on eggshells’ during their marriage due to his explosive anger. Several months into the marriage, Willoughby filed a protective order with a court in Alexandria, Virginia, after Porter violated their temporary separation agreement. A police complaint, filed on June 19, 2010, states that Porter punched the glass on the door to their home, cutting his hand in the process at which point she called the police. He then left and following that she filed a temporary protective order. Willoughby said: ‘My experience of our entire marriage was being with a man who could be both charming and romantic and fun - and even thoughtful and kind; and horribly angry and manipulative. "These outrageous allegations are simply false. I took the photos given to the media nearly 15 years ago and the reality behind them is nowhere close to what is being described. I have been transparent and truthful about these vile claims, but I will not further engage publicly with a coordinated smear campaign,” he said. According to Axios, no one at the White House pressured Porter to resign. Prominent White House officials defended Porter following the accusations, with Chief of Staff John Kelly calling him a “man of true integrity and honor and I can’t say enough good things about him. He is a friend, a confidante and a trusted professional. I am proud to serve alongside him." Press Secretary Sarah Huckabee Sanders meanwhile said he’s "someone of the highest integrity and exemplary character." “Rob Porter had been effective in his role as staff secretary and the president and chief of staff have full confidence and trust in his abilities and his performance,” she added.